Today, as individuals and as a society, we are faced with highly complex challenges. When we don't solve them correctly they rapidly become crises. This book explains how we can use complex systems research to solve complex problems in: ♦ healthcare ♦ education ♦ military conflict ♦ ethnic violence and terrorism ♦ international development. Highly complex problems cannot be solved by any one individual. Traditional organizations, traditional forms of control and planning are not effective. Making Things Work draws on insights from complex systems research about emergence, complexity, patterns, networks and evolution. It explains how effective organizations form through cooperation and competition, and how to make non-hierarchical distributed organizational structures effective at their tasks. About the author: Yaneer Bar-Yam is the President of the New England Complex Systems Institute and author of Dynamics of Complex Systems, the premier textbook on the science of complex systems. He has been working with: military planners on military organization, technology and transformation; healthcare executives on medical errors and quality of care; systems engineers on Air Force real time systems; members of the intelligence community on ethnic violence and terrorism; educators on education system reform; and executives at corporations on corporate effectiveness in an uncertain highly competitive world. Here he shares insights about ways to apply concepts from the study of complex systems to real world problems. This book deals with pressing issues confronting our society and gives a new perspective on how they can be addressed using novel tools from the study of complex systems. The scientific study of complex systems is attracting the attention of executives and policy makers because our society has reached a remarkably high level of complexity. New ideas are essential to meet the challenges we face. "Complexity is the science of the 21st century. The catch is that we may have to wait decades to see it applied. Bar-Yam offers a convincing case, however, that the applications have arrived: many complex problems occurring in business and society can be successfully solved using the insights and tools of the emerging field. A thought provoking work by one of the field's prominent thinkers." This book is bound to please anyone who wants to grapple with the complexity of today's world and organizations, and is interested in the truly big picture and issues. Part I explains concepts central to complex systems, such as: parts, wholes and relationships; patterns; networks and collective memory; possibilities; and evolution. The second and major part of the book focuses on how we can apply complex systems ideas to help solve such major real-world challenges as: military warfare and conflict; health care (the system and errors); learning and the educational system; international development; enlightened evolutionary engineering; and global control, ethnic violence and terrorism. The first hurdle is to comprehend these problems using our knowledge of complex systems and then begin to address them using a complex systems framework. The book is intellectually refreshing and bold. Its content is expansive, enlightening, and mind-stimulating. In "Making Things Work" Yaneer provides the reader with an excellent, non-technical discussion of some of the more important concepts in Complexity science. Like other successful popularizers of science such as Carl Sagan, Yaneer has a gift for explaining difficult subjects in a way that everyone can understand. He then shows how these concepts can (and should) be used to address real-world problems such as the health-care crisis and education. It should be required reading for policy-makers and business leaders. For a more technical treatment, I'd recommend Yaneer's earlier book or better yet, take a course at NECSI. "Making Things Work" is one of those rare and to-be-treasured books which 1) addresses serious and difficult problems and 2) is an easy and interesting read. Bar-Yam applies key principles of complex systems to many of the large and seemingly insoluble problems that we face as a society and gives us a reason to hope by providing new ways of understanding and addressing them. Bar-Yam's approaches are not simplistic panaceas. Implementation requires new ways of thinking and acting. The only caution I have is that, for most people, it takes time and mental discipline to be able to use these powerful ideas effectively. "Making Things Work" is both an excellent introduction to the science of complex systems, and an engaging application of those concepts. The text is concise and clear, making the topic accessible to anyone with an interest in problem-solving and thinking about problems in a new frame. I would recommend this text to anyone who deals with complex problems, from executives to academics! Great book! I read the author's previous book "Dynamics of Complex Systems," which is also an outstanding book that offers a more technical and in-depth look at complex systems in textbook form. 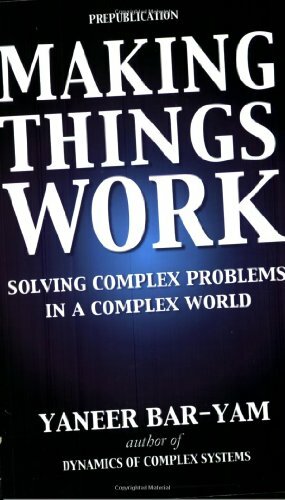 The new book, "Making Things Work: Solving Complex Problems in a Complex World", presents complex systems concepts in a clear and understandable manner. Most of the book is devoted to detailed discussion of real world examples from the military, health care, education, international development, engineering, and global ethnic violence and terrorism. The author provides thought-provoking insights as well as innovative approaches to dealing with the complex problems in these areas. The world could be a different place if more people read this book. Making Things Work is a truly enlightening work. It opens your mind to a new way of thinking and approaching real complex problems. The author provides both the scientific framework of complex systems in a readable form as well as the practical application to various real problems. The chapters on healthcare as well as the chapters on education have inspired my thinking. Making Things Work is a lucid presentation of an important topic that takes the reader by the hand and walks along a path that all would do well to travel. I particularly liked his preludes where he sets the social context and personal "ah ha!" he's experienced. This book is must reading for decision makers in industry and government. A well-thumbed copy should be found on the shelf of any person claiming to think deeply about "transformation."